From off the shelf spacers for 8mm bolts to a cheap sump turbo drain fitting, from figure-8 cable ties to insulating the intercooler return – tips for everyone working on their own car. How many times have you needed spacers for a bolt? You know, when a stack of washers would look ugly? 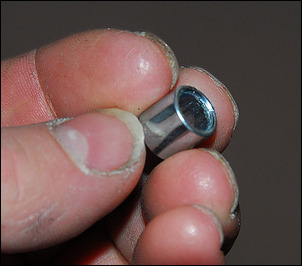 Spacers are surprisingly difficult to find as an off-the-shelf part – especially in steel. But if you need spacers to suit M8 bolts, wait no longer. These spacers, each 10mm long, are available as close as your nearest (or online) skateboard supplier. They designed to mount between the wheel bearings on 8mm diameter axles. And they’re cheap too…. When you’re installing a turbo in a car that never had one, you’ll need to organise a turbo oil supply and drain. The supply normally taps into the oil pressure measuring port – but what do you do about the drain? Best is if the sump is removed, a hole drilled and a fitting inserted into place through the sump wall. But if you look around, finding such a fitting is a fraction harder than you’d expect. What you need is a bulkhead fitting with a 90-degree bend and a hose barb at one end, the barb diameter to suit the drain hose you’ll be fitting. So here’s a cheap way of doing it. The fitting is actually a stainless steel boat fuel breather vent. It has the right size hose barb (typically 16mm ID), has a smooth right-angled bend, and can be inserted from the inside of the sump and then tightened into place with the supplied nut. But before you do so, just cut off the end of the fitting – the bit with the mesh windows. Then you have a free-flowing fitting that’s widely available, cheap (around AUD$20) and secure. It’s worth buying a handful of older tools at junk sales. Why? Because when you need a special tool, you can use one of these old tools as a starting point to make your own. That’s just what I’ve done with these pliers. By adding two pins and rounding the nose of the jaws, I’ve turned them into dedicated circlip pliers for a turbo I am using. On the turbo the large internal circlip needs to be released to allow the compressor cover to rotate – and since I’ll probably only ever use the tool a handful of times, making one like this beats buying one hands-down. If you are concerned that the air on its way back from the intercooler is being heated by high underbonnet temperatures, insulate the pipe! But what do you insulate it with? The insulation will often need to conform to bends, and also look neat and tidy. 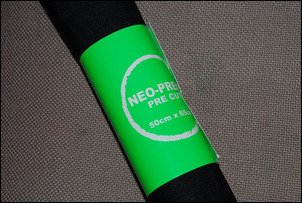 One approach is to use neoprene sheet. This material – think stubby holders or wetsuit material – has recently become available at shops selling dressmaking supplies. It can be sewn into a sleeve that is then slid over the pipe, or it can stretched and glued into place. Having the ability to tap holes with a thread is very useful. And taps are now cheaper than ever before. But how do you turn the tap? The traditional approach is to use a specialised handle. 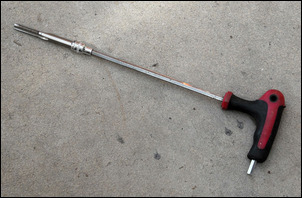 The combination of the handle and tap gives a broad T-shaped tool with plenty of leverage. But what if there’s no clearance for the T? Or you’ve bought a single tap for a one-off tapping? In that case, you might like to consider this. Pick a small socket that matches the size of a long Allen key. The square recess in the small socket is very likely to match the square end of the tap, allowing you to use the socket to easily connect the Allen key to the tap. If you have a long Allen Key with a T-shaped handle, you’ve just given yourself a useful tool that can operate the tap, even in difficult to access spaces. With the long handle, it’s easier to keep the tap square to the work piece, too. When re-organising wiring under the bonnet it’s hard to keep everything clamped into place without things starting to look very untidy. For example, how do you clamp large diameter wiring looms? You can try cable ties, but that never looks neat. So how about using ex bicycle clamps, the sort used to hold lights and reflectors in place? These clamps are usually made from nylon, and so are strong and quite durable. 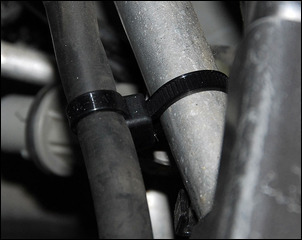 The part of the clamp that originally clamped around the bike tube passes around the wiring loom, and the other end of the clamp can be easily re-drilled to take a 6mm or 5mm bolt. The result is neat and durable. Back in Make your own tube beader we showed you how to make a tool that fits into a hydraulic press, allowing you to form a bead in intercooler plumbing. The bead helps prevent hoses blowing off under boost. The hydraulic press approach works excellently, allowing the formation of straight beads with little effort. But with some tubes using a press has a deficiency – those tubes that have a bend very near the end. In those cases, it’s impossible to rotate the tube fully - the bend fouls the press. So how do you form a bead in those tubes? This tool that we built is similar to many you can find on the web. 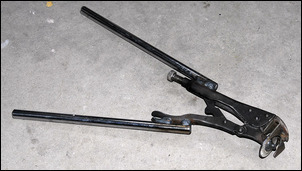 It uses a pair of vicegrip-style pliers with a large diameter washer and the lower half of a muffler clamp welded to the jaws. 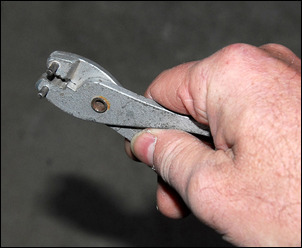 The difference with this tool is that the handles have been extended to allow a huge amount of leverage to be applied. 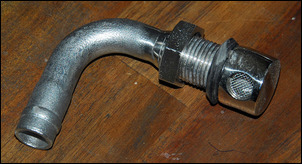 The tube is clamped between the washer and the lower half of the clamp, the levers operated to form the bead depression, and then the tube rotated and the process repeated. With such long handles it’s possible to form a bead, even in stainless steel tubing. But note that our previous approach of using the hydraulic press works better – if the tube shape allows you to use it. Here’s a LED upgrade that really works. Cheap, too. If you want to replace a filament bulb that uses a BA15S base (bayonet mount, single end conductor, 15mm diameter base) of the sort widely used in 20W automotive applications, there’s now an excellent LED replacement available. But here’s a key point – the light must be of the sort where directionality is important, and where most of the light needs to come from the end of the bulb. Good examples are reversing lights (where you want all the light aimed out the back) and other focused lights. Poor examples are indicators (where the light needs to be widely spread), and trailer lights (where often the bulb is mounted on its side). The LED bulbs use a machined aluminium heatsink, high quality Cree LED, and glass focusing lens. Furthermore, it appears that they use a DC/DC power supply within the bulb – the light runs at full brightness from 6.5V and is spec’d up to 16V. At the time of writing, a pair of them cost just AUD$12 including postage. Search on eBay under “2x 1156 BA15S 7W Cree LED Car Signal Reverse BACK-UP Light Lamp Bulb Pure White”. 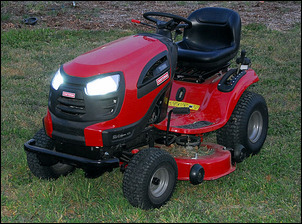 Here’s a pair installed in a ride-on mower – the headlights are brighter than standard, and brightness no longer varies with revs…. If you’re like us, you’ll find that your work often overflows your shed – no matter how big it is. So how do you light the area outside your shed – your driveway, car-parking area or similar? Above we described how LEDs can replace traditional lighting – and outside floodlights are no exception. However, at the time of writing, LEDs remain very expensive for commercial-quality floodlights. 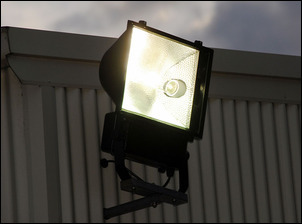 But not nearly so expensive – in fact, downright cheap – are floodlights using metal halide (MH) bulbs. These bulbs need a special electrical driving circuit that is contained within the floodlight housing. They require wiring-in, but if you have a power-point handy, that’s dead-easy – just wire a cord and plug to the light. Our experience suggests these units will very brightly light around 400 square metres. Like all MH lights, they take a while to come up to full brilliance, but then they are very, very bright indeed. Here’s a brilliant idea – cable ties that can be configured into a figure-8 shape. 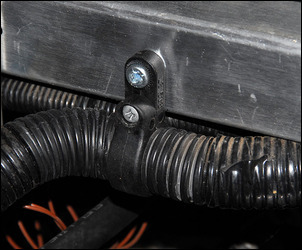 Rather than having only one opening for the cable tie to pass through, there are two openings, allowing two loops to be formed. Uses? Wherever you need to run two cables or pipes close to one another, but with a short stand-off distance between them.